This honestly shouldn’t be news. The fact that a health food store like Whole Foods wouldn’t support mandatory labeling of GMOs (genetically modified organisms) is preposterous. Or is it? 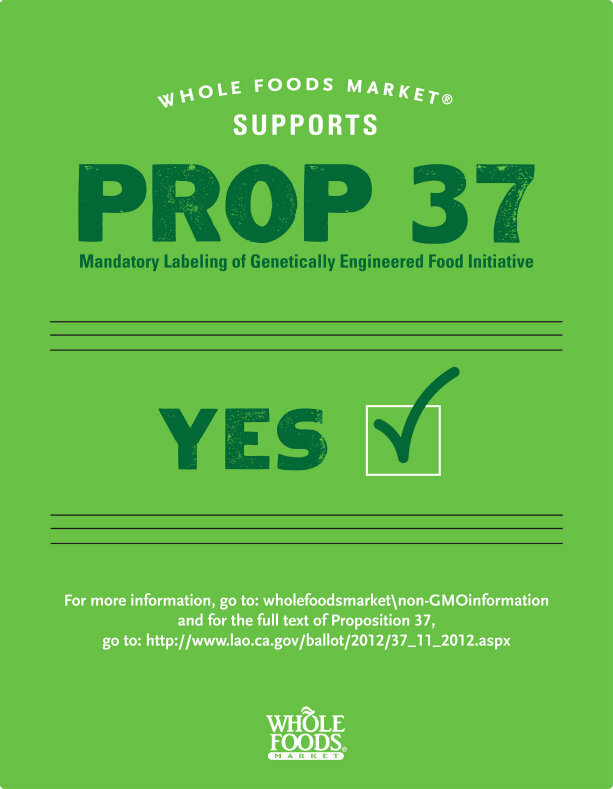 Whole Foods Market announced this week that they are in support of Prop 37. They even created this nifty green image to show their Prop 37 love. My question is, what took em so long?? With election day only weeks away, Whole Foods should have been on this wagon months ago. Regardless of their few reservations, I am quite frankly relieved that Whole Foods has supported Prop 37. This is an issue close to my heart and one that I expect certain companies to embrace. Be Food Smart is a proud supporter and partner of California Right to Know and Yes on Prop 37. To learn more about Prop 37, visit: CA Right to Know.